I forgot to charge the battery of my electric bike last night. This resulted in an accident on the way to school this morning as I was riding up a very steep hill. As I compensated for the lack of battery power by shifting down gears, the bike slowed down so much, it tipped over! This hurt me physically but that was nothing compared to the emotional hurt I was about to experience as I laid there on the side of the road. First, a car went by me. It slowed down to avoid me but didn’t stop. I didn’t think too much of it as it is a narrow road and I reasoned that may be there wasn’t enough room for the car to pull over which explained why they kept going. But then a number of people, all by themselves, walked by me too. I thought this very strange and not a little bit hurtful! Did they think that I was casually taking a rest on the side of the road with a heavy bike on top of me? Did they think this was normal? Were they worried that if they asked me if I needed help that I wouldn’t understand the Japanese? This is definitely not the case. My Japanese may consist solely of sushi ordering vocab and taxi instructions but lying there, prostrate, bleeding and in not an insignificant amount of pain, you could of asked me in Swahili if I was ok and it would have been clear to me. You could have used one of the rarer Inuit languages to ask if I needed help and I would have understood you like it was my mother tongue! Come on people! 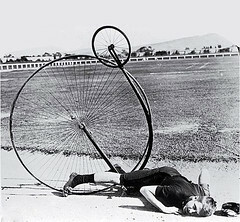 When you stumble across a woman on her arse under a bike, help her up. The bike is heavy and her day has not begun the way she planned. Don’t ignore her and make it worse. Lift the bike off her! Oh dear. Where were all the very caring Japanese? Hope the day is getting brighter for you though. Thanks mum! I told my grade 7 class this morning of my experience and they said that was typical Japanese – not wanting to help strangers. I don’t know if this is a unique trait to this country though as the almost identical situation occurred in Germany and no one helped me there either. I think humans in general just ignore strangers! 😦 I’m sure there is a psychology experiment in there somewhere. Maybe it is the age of the victim that counts – when I fell at Yokohama station two men appeared from nowhere with towels etc!!!!! !